Top recruitment consultancy for Gulf Jobs : Candidates those who are in serious job search in Gulf country and facing lot of problems in job searching and tired at job search process. Don’t worry, today we are going to help you out with the Top recruitment consultant for gulf jobslist Article. Hope, it may helpful for all the job seekers in gulf country. Solaris-1, D- wing- -44 Opp. L&T Gate No.6, Powai,Mumbai-400072. Tel: 022- 40220315 / 16/ 17/ 18, 8898770810, 09022605213 Mr. C.S. Nair -: 09322205213, Email: recruit@medhahr.com I medhahr@gmail.com Website: www.medhahr.com WE HAVE NO BRANCHES. Basement, Gowalla Building, Opp. Vihar Hotel, Nehru Road, Santacruz East, Mumbai-400055. VARSHA CONSULTANCY SERVICES PVT. LTD.
TREHAN INTERNATIONAL CONSULT. & ENGG. PVT. LTD.
No one conceltency in hyderabad ? Myself Ayesha Kafeel Ahmad siddiqui from Lucknow, looking for a job with my husband in gulf and having 9.5 years of experience in HR, administration and business analyst profile. I am looking for a job. I have more than 15 yrs experience in as a Camp Boss. If have any vacancy call me or mail me. Dear Consultants, I am a Mechanical engineer with 25years of Industrial experience in Maintenance and Project Engineering please contact me if you have vacancies my personal mobile number 00918149946609. I am having more than 11yrs experience in money exchange house as BIC & Head Cashier in UAE. I have 6 year experience for network engineer position. I am MCA qualified. I want to work in gulf country, Kindly let me know. Hi My name is Mohammad Rafik shaikh and I am science graduate. I have 3 years experience in vodafone retail store and 2 years experience in international call center (wipro BPO). please let me know if there is any job related to my profile. I am Abhishek and I am seeking for a job in gulf countries especially in Dubai. I am B.E. Mechanical with 2 years experience in Purchase, Production and Quality. I am looking for a position in Purchase department in Gulf Countries. If you have relevant vacancy, then please inform me through e-mail. > > My name is muthumurugan . > > I am presently worked as per a safety officer assistant in Target engineering construction co.( oil & gas ) Abuthabi,u.a.e. > > You have vacancy please contact me. > > Kindly Below attached my CV. > > To work in an environment which offers a good opportunity to share my knowledge and skills with others and participial myself and work towards for a complete satisfaction of the company. > > Worked as a safety officer two years in India. > > Hyundai car company. > > Self-motivated & capable to mix easily with different situation. > > Hard worker and honest . > > Discipline and team worker. > > Perform assigned task with grant responsibility. > > Sincere and result oriented & good communication. > > LANGUAGE KNOWN : English,Hindi, Tamil,Malayalam. > > I hereby declare that the above furnished information are and correct in best of my knowledge and belief. Looking for a job in gulf. I have more then 12 years of experience in Insurance claims, operation, BPO. Working as a Process Leader. Please let me know if there is any job available in gulf. I am looking for a job. I have more than 8 yrs experience in as a Camp Boss. If have any vacancy call me or mail me. only experience in welding fabrication supervision in structural steel. I NEED A JOB FOR GULF COUNTRY FOR OIL N GAS FIELD..i have 6 months experience. I am Mohamed Yousuf I have complete B.E Electronics and communication Engineering.I am looking for gulf job.I having 2years experience in Hardware and Networking Field.If have any vaccancy call me or mail me. I need a job for gulf country for civil construction company… I have 1 year experience. My name is Fazal Khan, I have recently qualified my PGDM (Finance), I am looking for a job in finance. I already have 2 years experience in capital market as a reconciler. Please let me know if there is any suitable profile. Hoping to get an update soon. I’m Shankaranarayanan i have completed D.M.E, I’m looking for job in gulf countries i have 5 years of experience in Stores and willing to relocate immedietly kindly consider and oblique. I have completed pharmacy.is vacancyavailable in dubai?? I am Mohammed from Chennai,BE Mechanical. Myself Md Waseem Akram from New Delhi looking for a Mathematics Teacher job in gulf country.please help me. I’m Mohd Waseem Khan from Jodhpur Rajasthan. I have completed M.Com/PGDM with 7 year experience in vehicle finance & Retail Store Management. having a experience of 3.5+ in Finance sector,kindly let me know for any suitable positions in abroad. I’m Mohammad Nasir and I’ve done Mba in marketing. I’ve more than 2 years experience in store keeper and 06 months experience in retail as a sales. Still im searching a job in julf, If have any vacancy regarding me experience then please inform me at my contact no. Myself Mayank Aswal,B.tech in mechanical engineering having 06 years of extensive experience in thermal and hydro power plants in fabrication and erection of heavy steel structure with project planning and controlling, mechanical quality control,SAP Functional for project requirements. I am interested to work in gulf country.if any job suitable for me .Kindly give feedback. Hi I am zulfekar qureshi I have more then 4 years of experience in baking sector mortgage, Personal Loan and Credit Card underwriting kindly let me know if any vacancy is their. My Name is “Navin Kumar Srivastava” & I’m looking for Operational Profile jobs in Gulf Region (Bahrain / Oman / Abu Dhabi / Dubai). kindly look affirmatively for my application ‘ll ever grateful for you all. Seeking Jobs – Storekeeper / Supervisor / Data Entry Operator / Online Ticketing & Other Works etc. Dear sir!my name is Nammi Srinivasa Rao ,API 570 Certifed Plant Inspector/CSWIP3.1 Certified welding inspector.please inform me for any interviews at any where in gulf or africa. Need Mechanical Engineers for UAE&SINGAPORE. Please CV along with your degree certificates. hi my name is arif i am looking for job in sales and marketing i have 5 years plus experience. 2 years in gulf 3 years plus in india. I have 4 year experience for quality engineer position. I am B.tech qualified. I have 10.5 Year Experience with B.Tech Mechanical, in Automobile seactor with One Year Experience in Lean Six sigma. I am very intrested to Work in gulf country, please if you have any opportunity let me know. My Self E.L.N.Raju From Mahaveer Consultants so please plan Client Interview one day in Visakhapatnam we have our own welding Works & Testing Center. We are pleased to introduce ourselves as one of the leading Manpower Recruitment Agencies for domestic (India) and overseas countries. We are duly approved by the State of Labor, Central Govt. Founded in 2013 in, India, ” MAHAVEER “is one of India’s reputed & professionally organized recruitment & placement agencies. It stands taller than the rest. MAHAVEER is a company providing services to industry verticals such as Manpower, Education, Tour & Travel and IT. We at MAHAVEER are equipped with all facilities under one roof. our kind cooperation in this will be highly appreciated . Kindly response to this mail . 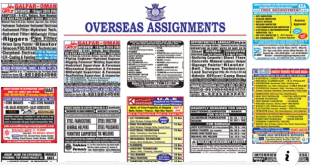 I am just searching Office Assistant job in Gulf Country. 12 Yrs experience as Office Assistant. Its head office in London. My name is Uzair Aziz. I have done B-Tech in Information Technology(IT). Also i have done Post Graduate Diploma in Advanced Computing(DAC) from CDAC Bangalore. I am senior .Net web developer. Currently staying in Delhi. Having 7 years of experience in .Net technology(C#, Asp.Net MVC, Entity Framework, JQuery, LINQ, WCF, Web API, HTML, CSS, Bootstrap, SQL, SSRS). Please let me know if there is any vacancy in .Net(IT Sector) or if there is any instructor/Teacher vacancy for C,C++, Core Java, C#, SQL, DBMS etc. in any gulf region. I am having nearly 14 years of experience in various field of accounts as well as procurement. Around 7 years experience i had in Saudi as Senior Accounts Asst.